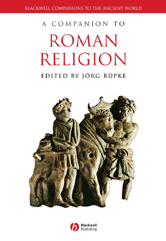 A comprehensive treatment of the significant symbols and institutions of Roman religion, this companion places the various religious symbols, discourses, and practices, including Judaism and Christianity, into a larger framework to reveal the sprawling landscape of the Roman religion. An innovative introduction to Roman religion. Approaches the field with a focus on the human-figures instead of the gods Analyzes religious changes from the eighth century BC to the fourth century AD. Offers the first history of religious motifs on coins and household/everyday utensils. Presents Roman religion within its cultural, social, and historical contexts.